While such incidents are common, no one is to blame except municipal leaders, irresponsible pet owners, the National Farm Community, the National Farm Hired Hand Community, and whoever was assigned to refresh the public water bowl. To be fair, farmers market organizers try to protect dogs and their Giants by establishing a list of rules of pet behavior, then posting them on event signs and websites. Often these guidelines feature humorous titles like, “Doggie DoDo’s and Don’ts,” sport cartoonish canine images, and are loosely based on the American Articles of Confederation ratified in 1781 by 13 states, but only three dogs. Best to avoid those farmers markets. And towns. 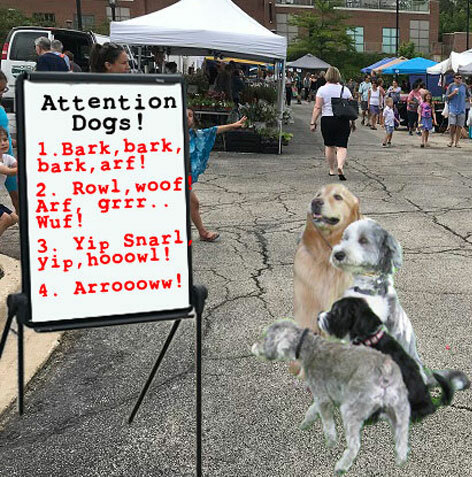 On entering the market after proving to security that your empty tote bag is, indeed, empty, your dog is an American citizen, and you are not assigned to refresh the public water bowl, prepare yourself to experience a festival that is equal parts Mardi Gras and the Running of the Bulls. Unfortunately on the same street. Sleeping between Giants welcomes your comments. Probably…. « Watch Your Step, Giants! I learn so many things from reading this column. I can’t tell you how long I’ve believed that FIVE dogs actually ratified the Articles of Confederation–I feel so stupid now. By the way, step away from the melons and no one gets hurt! Another home run with this post! Thanks, Lee! Because so many of my readers are young children, I try to pepper my columns with revealing and historically accurate facts. Did you know that one of those three signatory dogs was named Repub-Licky and the pet of Founding Father Monroe Doctrine? Repub-Licky often ran loose among the gathered members of the Second Continental Congress, inspiring them to form a “Republic.” Also running off with their writing quills, which drastically slowed the ratification process. Remember Repub-Licky! (Singing) The More you KNOW!